"I never asked once what the new NATO headquarters cost," Trump said, bringing attention to the glass structure. "I refuse to do that, but it is beautiful." 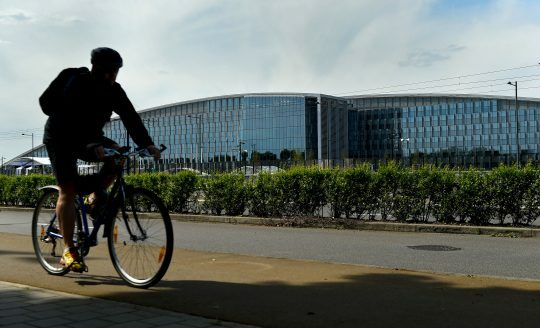 In fact, the building cost an astounding $1.23 billion, according to a budget released by the North Atlantic Treaty Organization. Architecture, design, and quality management cost the alliance $129 million alone. Audio visual installations ran $29 million, while construction ran $514 million, the document states. The alliance bragged that the structure is also a "green building for the future." "The environment and sustainability have played a major role in the design process. The new building’s energy consumption has been optimized through the use of geothermal and solar energy and advanced lighting systems. Thermal insulation, thermal inertia and solar protection have been incorporated in the design to reduce heating. Rainwater will be used for non-potable water use and the buildings short wings will have green roofs," the document states. In his remarks Thursday, Trump took NATO member states to task for not paying their fair share. "Twenty-three of the 28 member nations are still not paying what they should be paying and what they're supposed to be paying for their defense," Trump told leaders of the alliance countries. "This is not fair to the people and taxpayers of the United States — and many of these nations owe massive amounts of money from past years and not paying in those past years. Over the last eight years, the United States spent more on defense than all other NATO countries combined. If all NATO members had spent just 2 percent of their GDP on defense last year, we would have had another $119 billion for our collective defense and for the financing of additional NATO reserves," he added. Trump said NATO would be "stronger" in fighting terrorism if member states paid their obligations. This entry was posted in Politics and tagged Donald Trump, NATO. Bookmark the permalink.